Students at a large southeastern university typically find the introductory networking and telecommunications course difficult. This study examines the factors that contribute to the success of undergraduate technology support and training management students in this required course. College transcripts and academic student files provided the data, which were analyzed using multiple regression. In contrast to previous research, only performance in an introductory technology prerequisite course significantly predicted success. 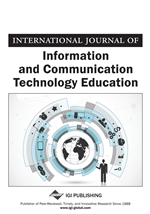 These findings have implications for faculty designing or organizing curricula who want to improve the success students in networking and telecommunications courses.